Payoneer’s Global Payment Service provides you with international receiving accounts that allow your international clients to pay you via local bank transfer – just like a local employee with a local bank account. As a regulated US company, we often require documentation to ensure the security of our account holders and to comply with industry rules and regulations. 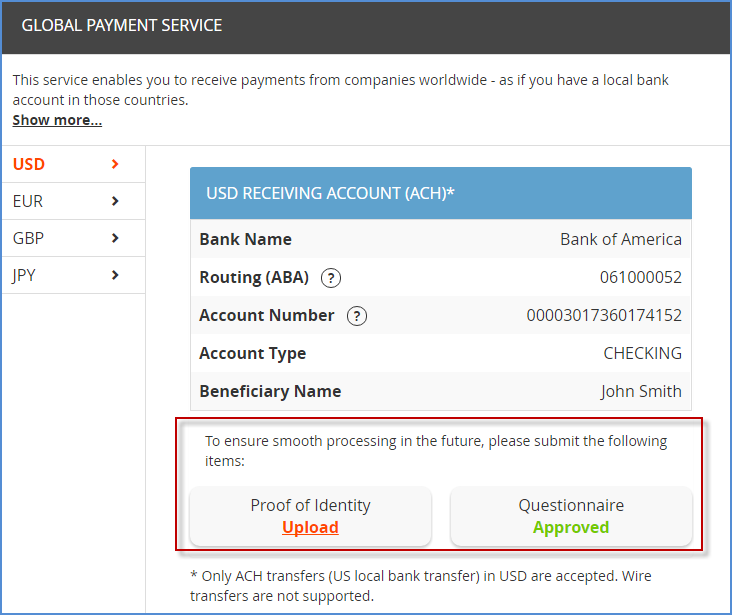 So, here’s how you can quickly and simply provide documentation in order to continue using the Global Payment Service. What is it? Your proof of identity is required to verify who you are. Upload a copy of a valid government-issued photo ID. A national ID card, passport, or driver’s license are all great. The ID cannot be expired. Make sure that you upload copies of both sides of your ID. The image of your ID must be clear, with no obstructions (such as your fingers). A colored copy is preferable to black and white. Scanned images of your ID are preferable to pictures. If you do take a picture with a camera or phone, make sure that the picture is straight and don’t use flash. What is it? The questionnaire helps us determine more about the products/ services you offer. If you’re receiving business related payments and do not fall into any of the above categories, fill in all sections of the questionnaire to the best of your ability and supply any documents that accurately describe your business.